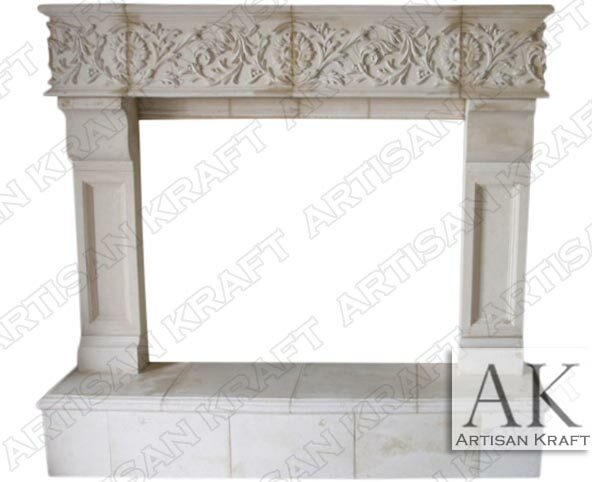 Phoenix fireplace mantel is a cast stone fireplace mantel that can be made from natural stone. The most characterizing feature of the surround is the mantel shelf frieze. Flowers and leaves form a repeating spiraling design. The raised hearth can be made in less sections. Depending on the size it can even be made in one piece. Corbel paneled legs can be made non-paneled. All of our GFRC products can be made-to-order. GFRC is another term used for precast or faux stone. These can be grouped together for man-made stone. This includes columns and wall paneling. More information about that and wall cladding can be found in that helpful link.